Coffee, cake, pudding, cool whip, and more coffee sounds delicious right? If you love coffee you will love this dessert. The chocolate cake is made with coffee and the whipped topping is sprinkled with instant coffee. 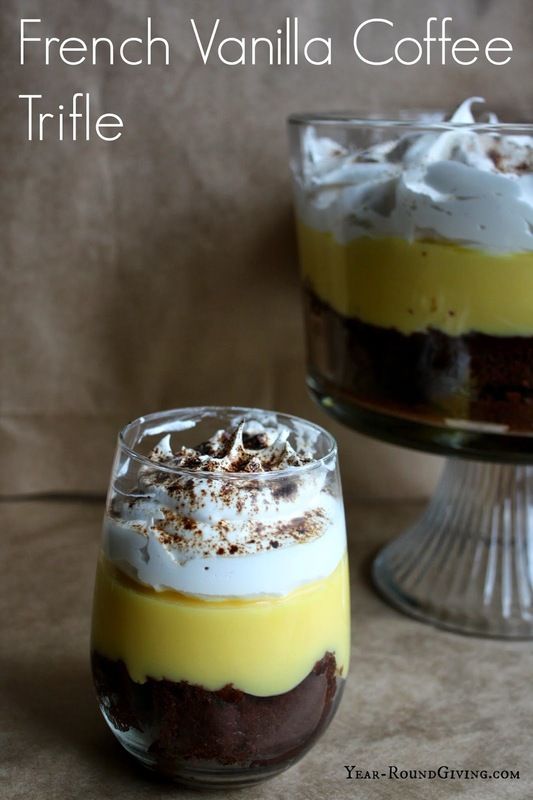 Through the middle of the trifle is a french vanilla pudding to balance out the dessert. 2 boxes of French Vanilla Pudding and 4 cups of milk. 1 box of chocolate cake mix and the ingredients it calls for. Bake cake according to the directions replacing 1 1/2 cups of water with 1 1/2 cups of cooled coffee. If the directions call for a different amount of water replace with that amount of coffee. Cut cake into squares and place in the bottom of the trifle bowl. You may have left over cake. Make French Vanilla Pudding as directed. Pour pudding into trifle bowl creating the middle layer of the trifle dessert. Spread whipped topping to create the top layer of the trifle. Sprinkle with instant coffee granules. Refrigerate for at least 10 minutes for pudding to set before serving. Save left over cake for cake pops. Place left over cake in a bag and place in the freezer. Thaw when ready to make cake pops. Wait to sprinkle instant coffee granules until you are ready to serve. The granules will dissolve slightly in the whipped topping. Love dessert? Me too! Follow along on Pinterest.